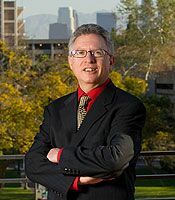 Marlon Boarnet is Professor of Public Policy and Vice Dean for Academic Affairs in the Sol Price School of Public Policy at the University of Southern California. Boarnet’s research focuses on land use and transportation, links between land use and travel behavior and associated implications for public health and greenhouse gas emissions, urban growth patterns, and the economic impacts of transportation infrastructure. He is co-author of Travel by Design (Oxford University Press, 2001), a comprehensive study of the link between land use and travel. Boarnet is a fellow of the Weimer School of the Homer Hoyt Institute for Real Estate, and he serves on the governing board of the Association of Collegiate Schools of Planning. Read more.